As I’ve written elsewhere, in the time period and area of the world I study, most people saw marriage as an economic and political contract between families writ small and villages (among the poor) or between entire clans and patronage networks (among the elite). The desire of individuals for love and companionship, understanding and compatibility, played little role in the choice of marriage partner. Instead, the dominant factors included things like whose lands ran together, which woman needed a husband to plow the fields or which man needed a woman to cook and clean, and who had close ties to those in power and in favor. Not to mention the possibility of children, without whom the family, village, or lineage could not continue. Health and fertility, especially among potential brides, also weighed in the balance, since bearing children was a wife’s primary responsibility. Personality had some importance, for sure, but only to the extent that it made a successful partnership more or less likely in the eyes of those charged with selecting the potential spouse. Parents and guardians, not the couple themselves, made that decision. Aristocratic fathers, to ensure that they had a free hand, secluded their virgin daughters within the household, keeping them as close as the ladies of any Turkish harem. But that was Europe in the premodern era. Nothing like that could have happened in the Land of the Free and the Brave in the twentieth century, right? 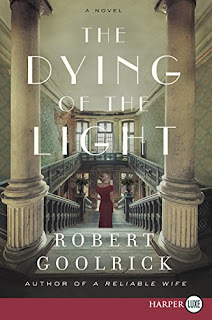 In my latest interview for New Books in Historical Fiction, with the author Robert Goolrick—whose new novel The Dying of the Light I also featured in last week’s post—we see that the United States in the Gilded Age, at least among its old landed and nouveau-riche entrepreneurial classes, was not so different from medieval Europe after all. The tensions created by selling one’s daughter to the highest bidder pervade this novel, determining much of its action as well as the complex and often contradictory relationships among its characters. As always, the rest of this post comes from New Books in Historical Fiction. Goolrick is an unusually thoughtful and fascinating speaker, so make sure to listen in. You’ll be glad you did! 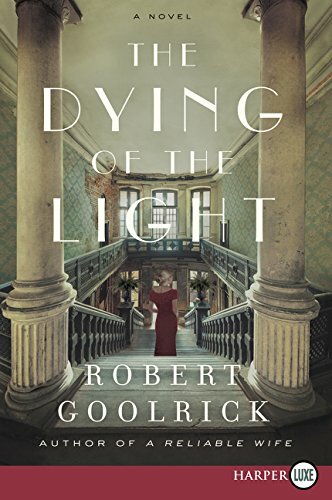 “It begins with a house and it ends in ashes.” So opens Robert Goolrick’s rich, lyrical new novel, The Dying of the Light (Harper, 2018). The house is Saratoga, a colonial-era estate in Virginia that is at once a joy and a burden to the family that lives there, the Cookes. In particular, it determines the life trajectory of Diana Cooke, the eighteen-year-old heiress charged with saving her family and her home from poverty right after World War I. Diana reluctantly embraces her destiny, agreeing to marry Captain Copperton, a wealthy but uncouth man who doesn’t hesitate to remind the Cookes at every turn that he owns not only the house but them, in principle if not in fact. But Copperton has one virtue in addition to his entrepreneurial abilities: he is a good father to the son he has with Diana. And it is, in the end, their son who unwittingly sets off the series of events that leaves Saratoga in ashes. Along the way, a cast of delightfully realized and often eccentric characters interact in sometimes predictable, sometimes surprising ways against the backdrop of Saratoga and its ever changing, ever inspiring river. As for me, I am almost, almost through the massive list of projects surrounding the release of my last Legends novel, The Shattered Drum. Stay tuned for the formal announcement next week. If you’re signed up at Five Directions Press, you will receive the press release automatically. And if you’re not, why aren’t you? We send out no more than six mailings a year—mostly announcements of new titles—and since our resident designer, Courtney J. Hall, puts her creative talents to work on those mailings, they are always exciting to see. Meanwhile, I hope to get back to writing—maybe as soon as this weekend. I can hardly wait!